This year I’m hosting Thanksgiving dinner for a pretty good size group. A lot of my out of town family is coming to stay for a couple of weeks and I’m SO EXCITED to spend this Thanksgiving with them. I truly couldn’t tell you the last holiday we spent together, so I AM beyond thrilled! Typically, our Thanksgiving and Christmas dinners are fairly formal. As in formal, I mean that all the adults are at one large table and the kid’s are at another table. We set the tables all pretty with fancy plates and goblets and cute place-cards and cloth napkins and all. The food is set on the tables and we all sit down and enjoy a delicious dinner together. 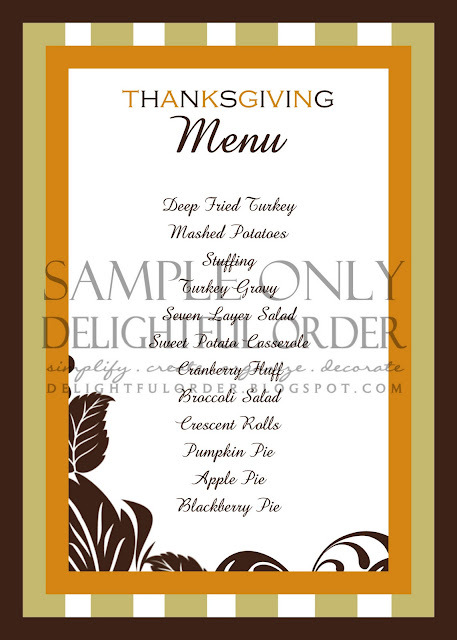 So to pretty up our informal Thanksgiving Dinner, I created a Thanksgiving printable set and recently added it to my Etsy Shop. For real, you can have a good lookin’ party with paper and I just LOVE.LOVE.LOVE. designing these things! This one is available HERE in my shop. and the custom menu card can be found HERE. Which include party circles, favor bags, placecard/food labels and a page with large matching fall leaves, which you can use to decorate with. Find my tutorial on working with party circles HERE. I got those little plastic goblets at the Dollar Tree last Christmas for the kids table. (The kiddos think they’re so cool drinking from those cups.) I’m hoping they still have them, because I plan on getting more. This is the thank you favor bag. Place a yummy chocolate inside, or you can put some candy corn inside a small Ziploc bag, tie it with brown and orange curling ribbon, cut the top off the bag and place it inside. Directions for assembling this piece are included, it’s super easy. You also get place-card / food labels. The ones in the package are blank. Use a calligraphy or gold pen and write in your guests name. Place at each table setting. For food labels, you can also cut the shape out and hang it from ribbon that is tied around glass jars. Fill the jars with festive candy, food, etc. There are so many ways you can use these labels. These are wonderful! I would love to use them one day if I am ever afforded the opportunity to host Thanksgiving (or any other holiday meal). How great to have your family coming to join you! Love your printables...very modern and fun. I have to ask...how does one deep fry a turkey?! I never knew there was any other way to cook them other than roast them in the oven? I really don't know how you deep fry a turkey, BUT I've heard great things about them.